Our Salt Lake City, Utah dishwasher repair and washing machine repair technicians are among the most skilled and experienced anywhere. Washing machines have made our everyday lives far easier. However, these machines can often break in a way that can potentially damage your home. When leaks occur on these devices, it often occurs behind the device. This means that water can be leaking for a large amount of time before the owner realizes. This can lead to extremely costly damage if not caught early. Mold can also begin to grow inside of the surfaces that have been exposed to moisture for some time. It is important to correct the damage before it gets to this point so the repairs are not significantly more than you were expecting. Repairing an appliance is far more expensive than removing and replacing a section of wall or flooring. Call us today to schedule an appointment with one of our expert technicians. Washing machines that are not in proper working order are also less efficient at actually cleaning your cloths or dishes. Improper drainage can lead to a buildup of filth and bacteria in your appliance. These types of appliances are among the most varied in terms of performance and energy efficiency. Depending on the type, brand, and age of your system, your dishwasher or washing machine may be much less efficient than a newer model. In cases like these, it may be in the customer’s interest to simple buy a new machine. Although the original input of funds will be higher, there can be net savings from the reduced power and water usage. If you are wondering how efficient your washing machine is, simply give us a call to find out. 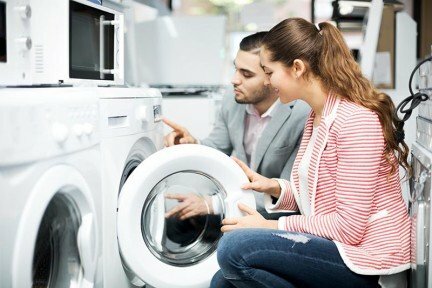 In general, a washer that loads through the front is both more water efficient and energy efficient. Top loading models tend to be significantly less efficient. Call us if you have a damaged reFridgeerator. Front loading washers also have more room inside for cloches as they do not have the central agitating element used to move the clothes around in a top loader. is often the most efficient way to wash your clothes. One of these machines uses about the same amount of water, regardless of the size of the load. This means that by putting more into the machine when you wash, you will have fewer loads to do overall. It is important not to overfill your appliance, which can lead to leakage or damage to the system. Most of the electricity used during the wash process is to heat the water. Whenever possible, we recommend using cold water to save money on electric bills. Many people who have newer washers and dryers have found that moisture builds up inside in between washes. This is because the seal on the door is air tight, and must be left open for a short amount of time after the wash cycle to ensure proper drying. Call us today to schedule an appointment with one of our Salt Lake City, Utah washer repair technicians.